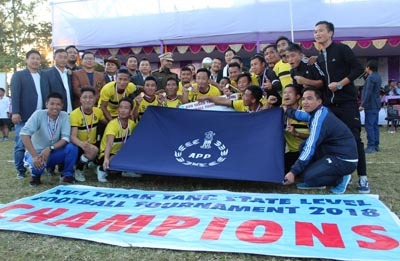 NAMSAI, Dec 28: Arunachal Pradesh Police (APP) won their maiden Tadar Tang Football Championship title after a 1-0 victory over host Namsai in the final here on Friday. Givindso Drai scored the winning goal just minutes before the end of the match. Earlier, both the teams started the match on an attacking note, creating chances, but could not convert any of those. The score remained 0-0 at halftime. After the break, APP coach Tapi Apa changed the formation from 4-4-2 to an attacking 4-3-3 by substituting captain Toko Poliam in the 70th minute. It paid dividends when Drai struck a few minutes before the final hooter, leaving the home crowd shocked. match along with Namsai Deputy Commissioner Tapashya Raghav and Arunachal Pradesh Football Association (APFA) secretary Kipa Ajay. Highlighting the recent achievements of the state in sports, Dr Chai said the government and his department would make every endeavour to establish Arunachal Pradesh as a genuine sports power. “The sports department is giving priority to develop the required infrastructure and facilities for the youths, so that they can compete against the best in the country and the world,” he said. Dr Chai said that there is no dearth of sports talents among the youths of the state, but admitted that there are issues regarding infrastructures and facilities provided to the players. He lauded the efforts of the APFA for the development of football in the state. He congratulated the sub-junior boys’ football team for their stupendous performance in the recently held national championship at Naharlagun, where it won the runner-up title.